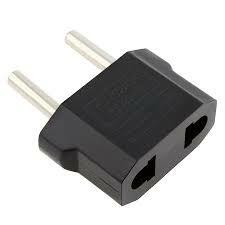 Charge your electronic devices while abroad with this 2 pins ungrounded US to EU adapter plug. This US to EU Power Plug Converter Adapter is is exquisite, safe, easy to carry, transform plug socket adapter which is suitable used indifferent countries. The plug and socket specifications, a relaxed, speak smoothly! This universal travel adapter can only convert current not voltage. Original plug set of meshing technique ensures the safety of the users.